Bad news, Outlook users: While you weren't looking, Microsoft gave the National Security Agency access to its email, chat and cloud storage products as part of the infamous PRISM program. That goes for SkyDrive and Skype, as well. This looks... not good. The Guardian just published its latest update to the NSA-is-watching-you scandal and cites top secret documents provided by Edward Snowden as proof that the Windows-maker has been in bed with spy agencies for years, despite directly denying involvement. We're not talking a few stray emails here and there either. Microsoft reportedly provided unencrypted access to Outlook.com and Hotmail email and chat accounts, SkyDrive cloud storage accounts and Skype video and audio calls. In other words, pretty much any communication that you might've made through a Microsoft product was being monitored by the NSA who then handed off the data to the FBI and CIA. 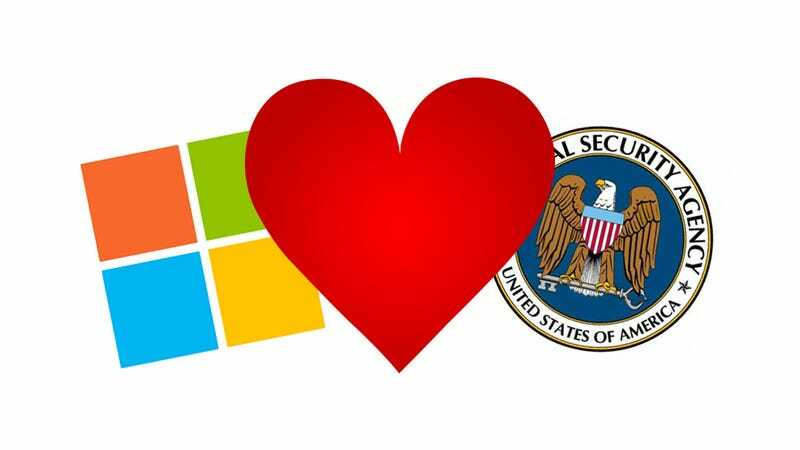 With all of the recent revelations about NSA surveillance, news of Microsoft's involvement shouldn't come as a huge surprise. Despite what the company has said publicly, it appears that all of the major tech aside from Twitter helped the NSA out in some shape or form. Microsoft is starting to look especially two-faced, though. A couple of weeks ago we learned that the company was offering up data from bug reports to the NSA without users knowing, and a few days later, it revealed that it received between 6,000 and 7,000 "criminal and national security warrants, subpoenas and orders" from local, state and federal authorities while maintaining that it didn't offer the government direct access to its servers. Except the whole time it actually did.